Black-Bellied President Dotes on Wife, full title Elite Hidden Marriage: Black-Bellied President Dotes on Wife, is a completed novel written by 夏青衫. It consists of 1656 chapters. After recently taking on the job as the President of Jing Sheng Group’s assistant, she is reported to the president, that has also just taken office, for work. Chapter 2 — You’re an Excavator, Right? Chapter 9 — You Have a Crush on My Brother? Chapter 11 — How Is Everything He Wears Good-Looking? Chapter 20 — Hurry, Take This Chance to Knock Her Up! Chapter 21 — Can’t Recognize Me After A Nap? Chapter 22 — Is She Your Woman? Chapter 36 — She Was The Person His Father Assigned? Is this dropped or continued to be translated? Can someone pick this up? Its such a wonderful story to be abandoned! Thank u so much for ur hardwork! 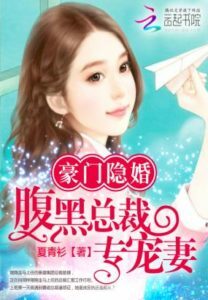 I just wanna know if u will still translating this novel or is it on hold? i wonder when is this novel going to be updated? Hi Waterlily thank you so much fo picking up and translating this novel, the only problem is that I can not open up your chapters it says error 404 page not found! please could you sort it out. Many thanks.